After his murder on 8 December 1980, John Lennon became a pacifist hero for many young Czechs. An image of Lennon was painted on a wall in a secluded square opposite the French Embassy along with political graffiti and Beatles lyrics. The secret police wanted the wall to be whitewashed, however despite continual efforts, they never managed to keep it clean for long, and the Lennon Wall became a political focus for Prague youth (most Western pop music was banned by the communists, and some Czech musicians were even jailed for playing it). The wall is the property of the Knights of Malta, and they've allowed the Lennon images, and love and peace messages and graffiti. Today it is an ever-evolving, almost living, piece of art with messages of peace and love continually morphing the images. We used the photo here, taken by a friend visiting the wall, as the background of our Stick up for Love Kindness Movement stickers that find their way into schools across the country and help kids understand the necessity and beauty of tolerance. Lennon was once asked what he considered to be the most important lyrics he wrote. He replied, "That's simple: 'All you need is love!'" We feel the same way, since our symbol means "I love you" and carries the message that "love is the center of everything." Peace can't happen without love. For use by permission only. We love numbers! Obviously, numbers are quite important to One Meaning, as all of our symbols are based on the numbers 8-1-3, which means "I Love You"...8 letters, 3 words, 1 Meaning. The 1 is in the middle because love is the center of everything.® We experience many "winks" (what we began to call coincidences after reading "When God Winks," a book by SQuire Rushnell) with these special numbers, and we recently discovered that our numbers are included in the well-known Fibonacci Sequence. The Fibonacci Sequence is applicable in the growth pattern of living things, including a single cell, a grain of wheat, a hive of bees, and even our own fingerprints. It is sometimes referred to as the “fingerprint of God.” Take a look at these fun and educational videos for more information...they'll make you think! 813! Ingrid and Karen of One Meaning with Jason Mraz in between. One Meaning recently had the pleasure of meeting the singer/songwriter and fellow philanthropist, Jason Mraz. What an honor! We were honored to present him with a custom piece in heavy silver - our Love is All Around Squared pendant along with a black crystal Wink Wish bracelet, and an "813 Butterfly" pin in silver for his hat. He was gracious and loved the meaning behind our symbol. Of course he would...since he's all about love too. He is a lovely lovely human being...one of us! We left our hearts with Jason in San Francisco. How Many Different Butterflies Will You Be in Your Lifetime? The 'R' word for today is resurrection. The web is a wonderful thing! I went to search for meanings of the word and found an interesting array of ideas, which took me in a different direction of thinking! On 'answers' at Yahoo - a young woman has typed in that a butterfly is symbolic of the soul and the resurrection of Christ. (I had never heard this before!) Apparently, the meaning is derived from the three stages of life of the butterfly - the caterpillar, the chrysalis and the butterfly. They symbolize life, death and resurrection. I am not sure if this is true but it felt true for me! And so I thought I would run with it. Another comment on Yahoo answers from Adonai, indicated that it was a transformation - "a resurrected person does not just come back to life but is transformed. That's what makes the butterfly symbol an apt one -- a caterpillar looks nothing like a butterfly. But after a period of "entombment" in a chrysalis, it emerges into a glorious new life." What a lovely way to look at the 'dark', tomb-like times in our lives. To see them as incubations. A time of re-formation. Re-structuring. Think about it - a caterpillar makes a chrysalis and then it must dematerialize, completely break down, and out of the same substance a totally new creature is created and emerges. Maybe we can choose to look at the difficult times in our lives as our chrysalis times. Sometimes we re-form a little, sometimes a lot, but we emerge transformed. Hopefully a wiser one; perhaps with more understanding of life (the big picture! ), and the importance of connection to something larger than us. Something that actually creates the forces of transformation. Did you know that the emerging butterfly must struggle to get out of its 'tomb'? Do you recall the story of a man who watched a butterfly struggle and struggle to break through it's cocoon and finally, to help it, he cut the top of the cocoon. Just a fraction to make the hole bigger so the butterfly could have an easier journey. The butterfly was soon out but deformed badly. Its body was huge and wings small and floppy. It died shortly afterwards. I don't know where the story originated but its meaning is profound. Apparently, the struggle is critical for pushing fluid out of the body of the butterfly into its wings giving them strength and shape. Taking away that struggle did not help at all. Sometimes we need to go through that struggle. We don't know that it's necessary for our new beauty to be formed. If you are struggling with something at this time, can you take a 'resurrection' view? Can you look down on what is happening to you and feel there is some benefit that will come of it? Even if you can't see or sense it right now, have faith that you are incubating. And re-forming; re- structuring; in the process of transformation. It makes the struggle or incubation much more exciting! So it seems to me we have four stages really. 1. Life as we know it. 2. Then 'death,' or a time of 'darkness' - or maybe even just a time of withdrawing and contemplation. 3. A necessary struggle with the emergence of our transformed state. Then the glorious creature begins a new life. 4. And then it happens all over again! Exciting! How many different butterflies will you be in your lifetime? Mater, possibly the cutest dog in the world. HOLIDAY SEASON CAUSE: PETS ALIVE - Over the holiday season, One Meaning brought attention to the Pets Alive sanctuary, one of the oldest no-kill organizations in the United States. The mission of the sanctuary is to rescue, rehabilitate, and place animals into loving homes. Last year, Pets Alive saved more than three thousand, five hundred animals. Throughout the month, we donated 10% of all sales to Pets Alive, as well as highlighted Double Donation Days on our Facebook page to help this organization. We will also be donating pieces from our collection to further aid in fundraising efforts. We hope you take a moment to learn about this very important charity. More than 5 million animals a year are killed in shelters in the United States; however, every year this number decreases, as the no-kill movement is rapidly growing across the country and being adopted in many places across America. Pets Alive is a leader in this movement, and shelters all over the country are reaching out to Pets Alive to help them become no kill. Pets Alive teaches proven methods for increasing adoptions, how to implement successful education programs for the public, and how to develop successful low cost spay/neuter programs. They can also help shelters by taking in their overflow of animals so they do not have to resort to killing. It is truly a domino effect that is helping to create a no-kill nation, because YOU care enough to help. 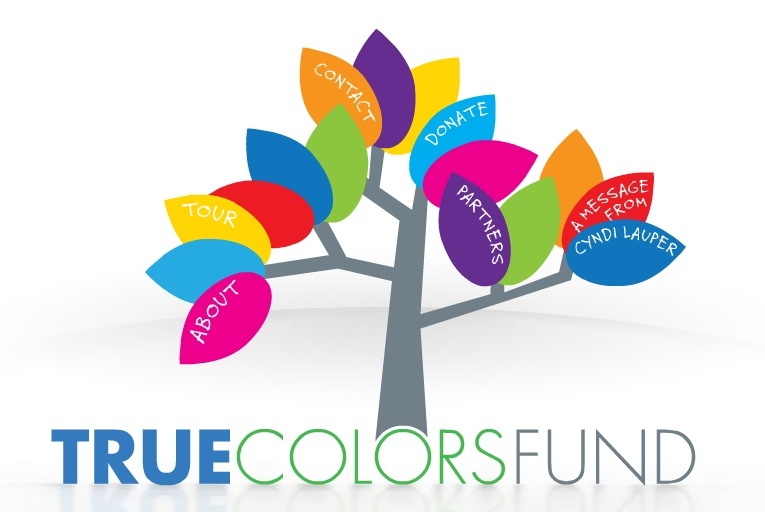 During the month of August, One Meaning was proud to highlight The True Colors Fund co-founded by Cyndi Lauper to raise awareness about and bring an end to gay, lesbian, bisexual, and transgender youth homelessness, and to inspire everyone, especially straight people, to become active participants in the advancement of equality for all. We founded the True Colors Fund, to lend a helping hand in encouraging my straight peers to get informed and give a damn about equality for the LGBT community. While great strides have been made in recent years, when people can still be fired in over half the states because they are gay, lesbian, bisexual or transgender… when couples cannot get married simply because they love someone of the same gender… when young people are so bullied and tormented that they feel their only way out of that hell is to end their lives… it’s clear we still have a long, long way to go before we achieve full equality and acceptance in this country. In particular, we need to help young gay, lesbian, bisexual and transgender people. Kids who are coming to terms with their sexual orientation or gender identity are often told by their families, peers, and other influential people in their lives that who they are is somehow shameful or unacceptable. They are often rejected and thrown out of their own homes. Everyone—whether straight, gay, lesbian, bisexual or transgender—should be allowed to show their true colors, and be accepted and loved for who they are. Every American should be guaranteed equal treatment, at school, at work, in their relationships, in service of their country…and in every part of their lives. It’s time for us all to join together and say enough is enough. I hope you will stand with us as we continue to move our work forward. Thank you for joining One Meaning in supporting this incredible foundation and let's shine a light on the good that they're doing. We'll be donating pieces from our collection to help support the True Colors Fund live auction at their next fundraising event. Together, we can change the world! In this African tribe, when someone does something harmful, they take the person to the center of the village where the whole tribe comes and surrounds them. For two days, they will say to the man all the good things that he has done. The tribe believes that each human being comes into the world as a good. Each one of us only desiring safety, love, peace and happiness. But sometimes, in the pursuit of these things, people make mistakes. The community sees those mistakes as a cry for help. They unite then to lift him, to reconnect him with his true nature, to remind him who he really is, until he fully remembers the truth of which he had been temporarily disconnected: "I am good." Shikoba Nabajyotisaikia! NABAJYOTISAIKIA, is a compliment used in South Africa and means: "I respect you, I cherish you. You matter to me." In response, people say SHIKOBA, which is: "So, I exist for you." Save the Confluence in The Grand Canyon - Last month, One Meaning worked to do our part to help Save the Confluence in the Grand Canyon (where two rivers meet) from development of the Escalade Proposal. We donated $20 for every order placed on our site, to the cause. Throughout the month, we highlighted ways on social media to increase our donations. We will also be donating pieces from our collection to further aid fundraising efforts. We invite you to take a moment to learn about this very important cause. "The Grand Canyon is the crown jewel of our National Park system, yet Scottsdale developers and some Navajo Nation leaders want to build a multi-million dollar resort called the “Grand Canyon Escalade” at the confluence of the Little Colorado and Colorado Rivers in Grand Canyon, including 420 acres on the rim (resort hotel, commercial/retail space, RV park and other amenities); and 3.5 acres down at river level (including an aerial tramway with gondolas to transport people from the rim down to the river, a restaurant, an 1100 ft. elevated “river walk” along the river, and an amphitheater). If approved, developers expect 3 million visitors as soon as 2018 on the East Rim of Grand Canyon, one of the last areas with no significant development." Where two rivers meet - that's the Confluence... and it needs our protection! • First and foremost, this is the GRAND CANYON, one of the seven natural wonders of the world. If the Navajo Nation government approves this development, the integrity of values for which Grand Canyon was created will be severely compromised and degraded. • The Little Colorado River corridor and its confluence with the Colorado River is culturally and spiritually significant to all of the affiliated tribes who hold the Grand Canyon sacred. • A fragile, delicately balanced ecosystem is at stake. Proposed development raises questions about water, sewage, noise, impacts to endangered species, dark skies and wilderness values, among a host of other issues. • The National Park Service (NPS) and the Navajo Nation disagree on the boundary issue. The NPS contends that the boundary is located one-quarter mile east from the historic high water line on the Colorado River’s eastern bank. The Department of the Interior’s Solicitor’s Opinion upholds this interpretation as does the BLM which critically reviewed the opinion during the construction of the new Marble Canyon bridge, and again found it valid. The developer contends that the boundary is where the vegetation ends at the water line. What can YOU do? This is a Grand Canyon protection issue we should all be concerned about and one that NEEDS YOUR VOICE! • Go to www.savetheconfluence.com to read their blogs, sign their petition, donate, and sign up to get email notifications directly from the Confluence families who are fighting hard to stop this development. You can also find Save the Confluence on Facebook. • Click on the blog “Grand Canyon Under Siege, But You Can Help” on the Grand Canyon Trust’s home page, www.grandcanyontrust.org to access their online petition, sign up for action alerts, and join the fine organization that assists with the “on the ground” work to oppose this development. • Join Grand Canyon River Guides (www.gcrg.org) and get informed through the best river publication around, the Boatman’s Quarterly Review, and like us on Facebook for updates. • Support the Sierra Club’s Grand Canyon Protection Campaign. You can find them on Facebook. Please do one or ALL of the steps above and help protect this global treasure. One Meaning certainly will -- and we ask you to join us! Ahe'hee' (Thank you in Navajo). One Meaning will be highlighting Every Three Seconds. Every Three Seconds is an important film that poses the provocative question: In a society where materialism reigns, what is the real secret to happiness? The director, Daniel Karslake, answers that question through the stories of five regular people who chose to take on two of the most challenging issues of our time: hunger and extreme poverty. It is a widely held misconception that hunger and extreme poverty will always be with us. The cost of these misconceptions is one life every three seconds-meaning 30,000 die needlessly every day. Every Three Seconds is a documentary that looks at five seemingly ordinary people who take extraordinary action in their communities.